For all the complaints and inconveniences caused by the previous 10 days of some of the worst winter weather to hit Britain in half a century, the Sports Journalists’ Association, at least, was grateful when it came to staging its 62nd annual British Sports Awards at The Brewery in central London on December 8. 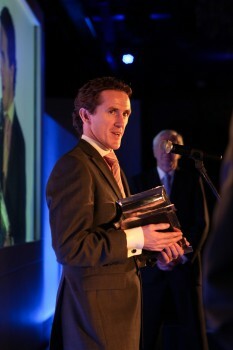 Because when that day’s Leicester races was called off with the course frozen solid, it meant that AP McCoy, the winner of this year’s ballot of SJA members to determine the 2010 Sportsman of the Year, was able to attend our awards lunch. You don’t get to be champion jockey 15 times by lacking determination when it comes to accumulating winners on wet, cold winter afternoons, and were it not for the icy weather, McCoy would have been back in the saddle on Wednesday. 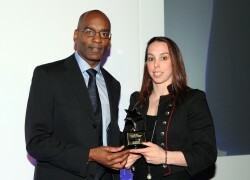 But in common with Fran Halsall, the record-breaking swimmer who trekked all the way down from Liverpool despite being on crutches following an ankle operation the previous week, or Dai Greene, the champion hurdler for whom the journey from Bath was no barrier, McCoy made his way to the SJA event, where he was presented with Britain’s oldest annual sports award by SJA President, Sir Michael Parkinson. McCoy, as we had been told to expect, made a typically gracious acceptance speech to the 300-plus members, guests and sponsors, UK Sport, gathered together to celebrate another great year for British sport. 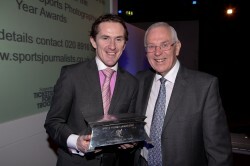 “It’s very flattering to win this award, when you see the list of past winners, and see the amazing candidates this year, great sportsmen like Mark Cavendish, Tom Daley and Graeme McDowell,” said McCoy on becoming the first jockey to win an award that had eluded Lester Piggott, Sir Gordon Richards and generations of other, whippet-slim, race-hard horsemen. “It’s great to have racing recognised by the broad range of sports journalists,” McCoy said. “The only good thing about the bad weather is that I was able to be here in person,” he said. McCoy, the 15 times champion jump jockey, had pulled off another photo-finish win in his illustrious career, narrowly taking the poll of SJA members from fellow Ulsterman, golfer Graeme McDowell, to cap off possibly his most memorable year, including as it did his first win in the world’s greatest steeplechase, the Grand National. 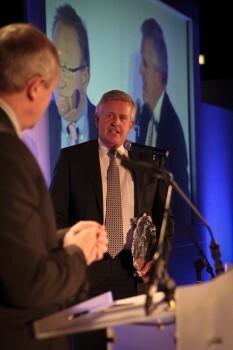 The SJA’s lunch was further graced by Colin Montgomerie, who received the Team of the Year prize on behalf of Europe’s Ryder Cup-winning golfers, and athlete Jessica Ennis, SJA Sportswoman of the Year in 2009, retaining that title after winning the European heptathlon title. Ennis, the world’s finest all-round woman athlete, was an overwhelming choice of SJA members to retain the Sportswoman’s crown, beating Amy Williams, the skeleton bob gold medal-winner at the Vancouver Winter Olympics, and world champion gymnast Beth Tweddle. Europe’s nail-biting Ryder Cup triumph at Celtic Manor in October won them the SJA’s Team of the Year title for the sixth time, ahead of the English men’s cricket team, unbeaten in Test matches in 2010 and Twenty20 world champions, and the medal-laden Great Britain rowing team. 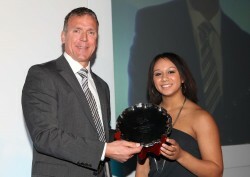 Other awards presented at the SJA lunch included the sponsors’ UK Sport Award for fairplay and inspiration, which went to Tweddle, while teenaged weightlifter Zoe Smith, a Commonwealth Games medallist, received the prize for Outstanding International Newcomer from former England cricket captain Alec Stewart. Emma Pooley, winner of the individual time trial at cycling’s world championships, received the SJA Committee Award presented by swimmer-turned-ballroom dancer Mark Foster. The award for outstanding performance of the year went to Dai Greene, winner of the 400 metres hurdles at the year’s three major athletics events, the European Championships, Delhi’s Commonwealth Games, and the IAAF Continental Cup. The SJA’s Bill McGowran Trophy, recognising the achievements of an athlete with a disability, is believed to be the world’s longest-established disability sport award of its kind, having first been awarded in 1963. In 2010, the award went to a Commonwealth Games gold medallist who beat able-bodied competitors in Delhi, Danielle Brown, a member of England’s victorious archery team. Swimmer Halsall, the winner of a record five medals, including the 100 metres freestyle gold, at the European Championships in Budapest, received the SJA President’s Trophy. All the award-winners on the day were interviewed on stage by co-presenter Jim Rosenthal, with Montgomerie, the Ryder Cup team captain, endorsing the SJA’s choice of Ticket for Troops as its nominated charity. Montgomerie also received the JL Manning Award, for his own outstanding contribution to sport off the field of play, from two members of the Tickets for Troops party, Christina Schmid, the widow of bomb disposal hero Sgt Olaf Schmid GC, and Afghanistan veteran LCpl Matthew Croucher GC. The former European No1 golfer was clearly delighted by his Ryder Cup team picking up another trophy. “When you see the six nominations for this award, it is a great honour for golf to come out on top, so thank you all. “It was an amazing four days… we were pushing the boundaries with weather in Wales in October. And we failed. “The Ryder Cup ended up with a totally dramatic end to the event, and as long as it was 14 and a half to 13 and a half on our side, it was a fine result,” Montgomerie said. “I was there supposedly to motivate, but there was no motivation required, motivation was given by losing the Ryder Cup two years ago. To try and win it back on home ground just became a responsibility really and an honour for me to be able to captain 12 such fine men. Every one of them contributed to that victory. “It was one of the few competitions I’ve ever been to without my golf clubs. I was doing nothing really at all just putting the players in the right positions and let them go and they did a brilliant job. “I must admit, playing would be easier than having the problems of managing such a team. Every time someone missed a three-foot putt, it was my fault. Like McCoy, Montgomerie clearly prefers winning, and questioned by Rosenthal, he confirmed to the audience at the SJA lunch that he wants to be back as a Ryder Cup winner as a player. “No team captain has played in the Ryder Cup since captaining the team, so there’s an opportunity,” Montgomerie said. “I’ll be 49 at that stage but golf gives us that opportunity to keep going on, I’ve just got to get my own game in shape and not worry about other people’s for a change. 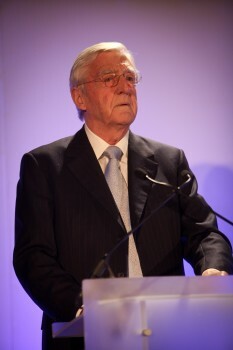 Opening the proceedings, Sir Michael Parkinson, the SJA President, made a keynote speech in which he called on his media colleagues in the audience to use the next eight years to investigate the conduct and management of world football body, FIFA. The week before, FIFA had selected Russia over England as host nation for the 2018 World Cup, and Qatar as 2022 hosts, amid allegations of bribery and corruption among the governing body’s ruling executive committee. Some English football officials blamed their £15 million campaign’s failure to attract more than two of the available 22 votes on the British media’s coverage of FIFA and its controversial president, Sepp Blatter. “I can’t make my mind up which event caused me most joy – the way our cricket team beat the Aussies in Adelaide or the manner in which the appalling Sepp Blatter and his FIFA cronies spared us the indignity of having to spend the next eight years in the company of men we ordinarily wouldn’t touch with a barge pole. “The Sunday Times and Panorama did the job of a free press and those who criticised them, including some politicians who really ought to know better and a handful of journalists unworthy of the description, should be ashamed of themselves,” Sir Michael said. “It would be reassuring to think we could now usefully spend the next eight years lifting the rock on FIFA and exposing what crawls beneath. Sir Michael’s tributes to the soldiers, sailors, air force personnel and Royal Marines in the audience, alongside some of the country’s leading sporting stars, drew huge applause, as well as a donation of £2,000 from a prize draw held for Tickets for Troops during the lunch. “Our very special guests today are not athletes but soldiers,” Sir Michael said. “We would like to pay a special welcome today to table No1, which we have donated to Tickets for Troops. Their guests today include members of the armed services who have been injured in Afghanistan, as well as Christina Schmid – the widow of bomb disposal expert Sgt Olaf Schmid, who was awarded the George Cross for making over 70 devices safe during one tour of duty in Afghanistan. Christina is a persuasive advocate in her work as patron of Tickets for Troops. “Could I also mention a special guest on Table 5? He is Matt Croucher of the Royal Marines who threw himself on a grenade to save his comrades from the blast. Miraculously, he survived without serious injury. He received the George Cross, the first Marine to do so since the Second World War. 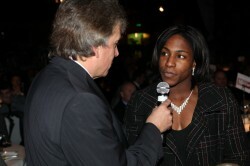 The 2010 SJA British Sports Awards marked the end of an era, with UK Sport, supporters of the event for almost a decade (longer if you consider the involvement with the formerly named Sports Council) announcing their withdrawal as sponsors, as a result of the Government’s cuts and its new policy on marketing by its agencies. SJA Chairman Barry Newcombe expressed the Association’s thanks for the sponsorship and regret at its ending. “Sponsors like UK Sport are hard to find in the current economic climate,” Newcombe said. “We would like to thank Baroness Campbell, Liz Nicholl, Tim Hollingsworth and everyone in the media team at UK Sport who have worked with us over the years for their fantastic support, helping us to celebrate the achievements of British sportsmen and women. “Everyone at the SJA hopes that, now we are getting so close to realising all the hard work that has gone in to preparing for the London Olympics, we will be seeing our friends at colleagues from UK Sport at future Sports Awards in 2011 and 2012,” Newcombe said.